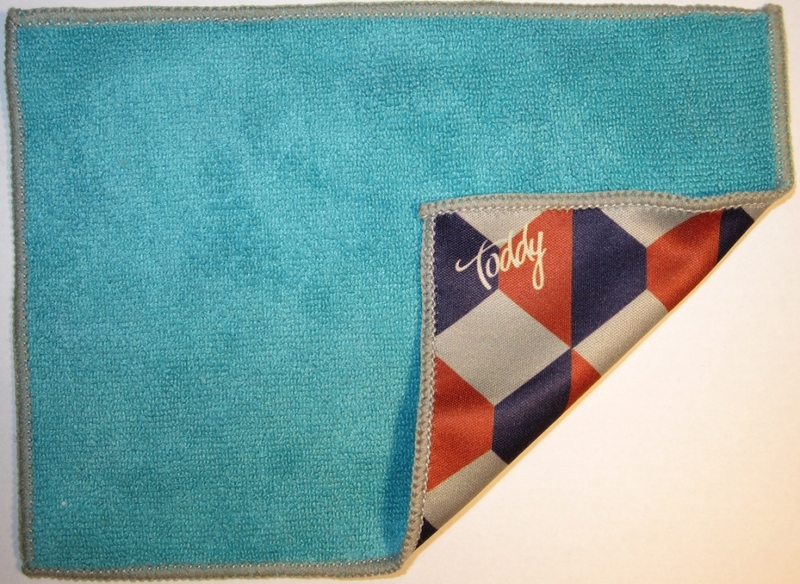 Toddy is introducing their new Smart Cloth screen-cleaner, claiming significant improvements over the current state of the art. “But,” one may say, “Don’t I already have a drawer full of soft cotton T-shirts and a handful of those microfiber things already?” This is a fair question, since a great many of our readers might say exactly the same thing. The first half is easily addressed – most ‘soft’ cotton shirts can still scratch, and tend to not have anywhere for a rough grain of dirt to go but into the screen or lens being cleaned. This is generally a bad thing. It is worth mentioning that a great many photographers use radioactive brushes to first break down any static adhesion (it’s called ‘ionizing radiation’ for a good reason) of dust to lens, and then brush it away gently, before even thinking about polishing off deposits, fingerprints, or anything else left behind by the brush. Most gadget-users would find this somewhere between inconvenient (‘where do I stash the brush?’) to deeply unsettling (‘An alpha-particle source in the pocket four inches from my — are you mad?’). And a great many of our gadgets suffer for it – a month or so ago, I put a rather visible gouge in my GPS in spite of trying to be careful. I even had a microfiber cloth in my car for cleaning it of the inevitable fingerprint collection, and I didn’t even notice doing the damage. Conventional wisdom says I did everything I could, and sometimes bad things happen to good technology for no good reason. Conventional wisdom was right a few months ago, but no longer – some particularly clever engineer has come up with a way to knit a cloth with soft, terrycloth-style loops on one side, ideal for not grinding grit into your glass, and a smooth ‘silk’ finish on the other, perfect for polishing your PDA to perfection. And it is awesome. But why not simply carry two microfiber cloths? Not a bad solution, but there are a couple good reasons. 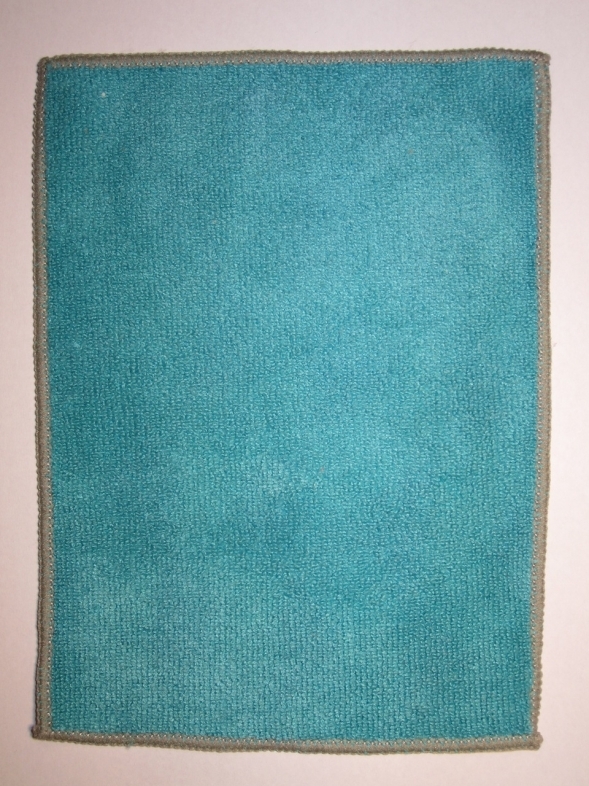 First, two generic microfiber cloths often retail for about the same price as a Smart Cloth (if not more! 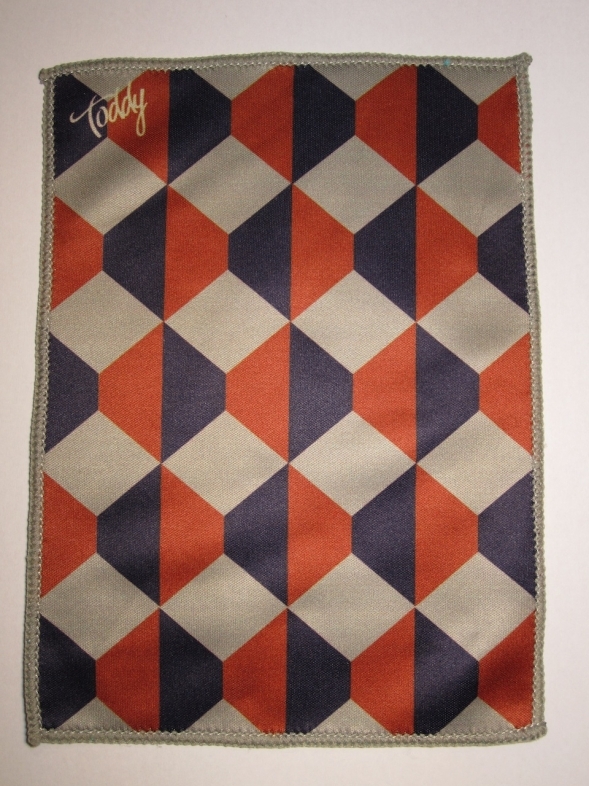 ), and second, the clever arrangement is not the only innovation Toddy has packed into their product. First off is a particularly clever antimicrobial treatment that is permanently, covalently attached to the fibers in such a fashion that it can’t be washed off, leached out, or otherwise diminished without first degrading the fibers in question. The method of action is probably most effective against gram-negative bacteria, but that classification conveniently encompasses a great many pathogens one would not want to pass around… though one must point out that most viruses (such as the flu) would not be harmed by the process; many would not be attracted by the permanent positive charge attached to the 1.4 nanometer hydrocarbon ‘needles’, nor would contact with the charge necessarily destroy a viral envelope the same way they do a Gram-negative bacterial envelope. In spite of that, the nanotech bonded to the fibers is quite useful – the single most likely source of bacterial contamination is likely to be the nosepieces of your (or others’) glasses, which in my experience have almost invariably been allowed to turn green with accumulated skin bacteria. Every other lens cloth I own has, at some point, been used on glasses. All save one have been used often enough to build up green streaks. Perhaps it would be prudent for Toddy to introduce a line of nanotech-coated nosepieces for popular sized glasses frames? They call them nano-“swords” and use a direct comparison in this video. Repeatedly. 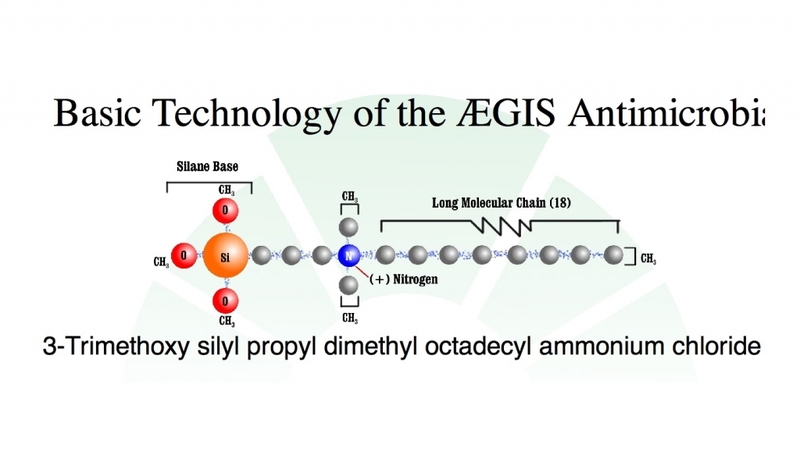 I’m pretty sure that was supposed to say “Antimicrobial” but the Flash video provided by Aegis was a bit out of whack. While the science is fascinating, only doctors and hospitals will buy it if it’s a lousy performer, for use in places where the liability of spreading a dangerous infection outweighs the liability of lousy pictures and scratched lenses. 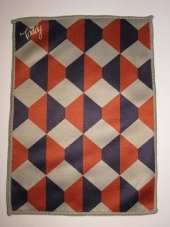 While the health care market can be a lucrative one, I am pleased to report that it will not be Toddy’s only market – were I to guess, they added a few other nanomaterials to their formulation, or came up with some truly impressive weave offering vastly improves surface area, as this thing takes the fingerprints off even the grungiest glasses with startling speed, and the convenience of the dual surfaces cannot be ignored, either. In a market saturated with “Me-too” products, this is one of a few that stands out with a simple, elegant innovation that provides a tangible benefit. Also, the materials chosen for both the sides just seem to work better, faster, and more thoroughly than their generic equivalents – you’ll have to take my word on this, since there is no good way to benchmark it. What does this mean for you, dear reader? I suggest that anyone with glasses strongly consider having one of these on their night stand to ensure that their glasses at least start the day clean. I also suggest emphatically that anybody buying a “digital camera accessory kit” consisting of a cheap case, lens cloth, and table tripod consider skipping it and buying what they actually want, and not simply that which is conveniently placed for an impulse buy. You will likely be much happier in the long run and replace less of your equipment, also saving money in the long run. Speaking of saving money, the street price of these seems to be around $10; I’ve seen much worse go for much more. It’s not always true “you get what you pay for”, sometimes you get a great deal less. Information is a customer’s best chance at avoiding that problem, and on this subject you can consider yourself an informed customer – don’t get suckered by $8 impulse-buy junk hanging by the cash register. Buy something solid, effective, and durable, and you will save a great deal of money in the long run. You’ll also be happier on the way there.